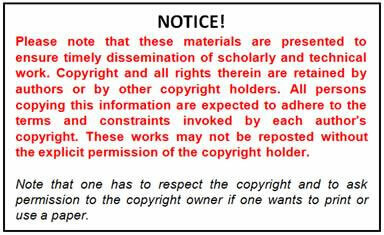 Copyright: Keele May 10, 2010 v1.0 First Release, Update July 6, 2010, v2.0 Updated CD! 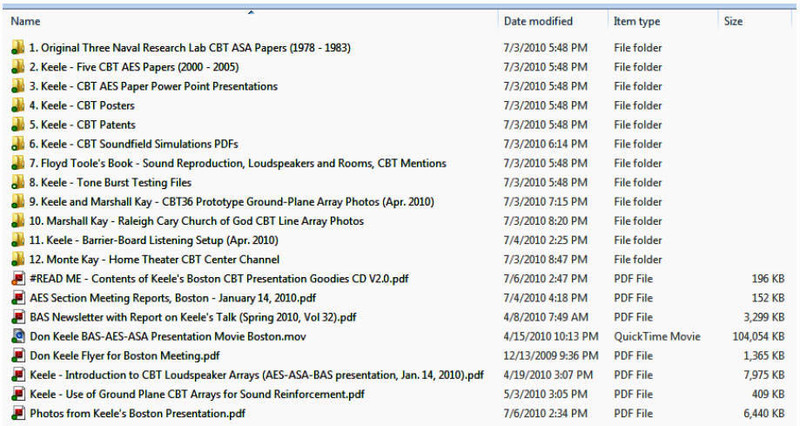 This CD contains a number of files supporting my Jan. 14th, 2010 presentation to a joint meeting of the Boston Sections of the AES, BAS, and the ASA titled: “Introduction to CBT Loudspeaker Arrays”. After a short introduction and a CBT talking point list, these files are described in the following sections. The CD also contains some extra goodies, including tone burst testing files and barrier-board listening photos and a related technical paper (cancellation of inter-aural crosstalk by means of a physical barrier), which are also described in the following. Constant Beamwidth Transducer (CBT) theory was first described in connection with spherical-cap underwater transducers in three unclassified ASA papers from the US military in the late 70s and early 80s (papers included on this CD). Starting in the late 1990s, Keele applied the theory to loudspeaker arrays in a series of five AES papers from 2000 to 2005 (also on the CD). He approximated the sonar transducers’ hemispherical cap with a series of small transducers and also applied the theory to loudspeaker line arrays. To create a CBT loudspeaker line array, several identical drivers are equally spaced around a circular arc and a special frequency-independent “Legendre” shading is applied. The shading attenuates the arc’s outside speakers as compared to those mounted near the center of the arc. An alternate version of the CBT array utilizes signal delays to effectively curve a straight-line array of identical equally-spaced loudspeakers. A ground-plane version of the CBT line array is also described that is specifically designed to operate over or near an acoustically reflective flat plane. Here the array height is effectively doubled due to the acoustic reflection, and the array’s low-frequency beamwidth control cutoff is extended down by an octave. Harman/JBL has recently copyrighted the CBT acronym in the loudspeaker industry where it means “Constant Beamwidth Technology”. Two patents were applied for by Harman on the CBT concepts — the first applied for in 2004 and still pending in Keele’s name and the second applied for in 2006 and issued in March 2010 with JBL engineer Doug Button (patents also included on this CD). These patents must be taken into account in any home construction DIY project. · No near-field: i.e. the mid and far-field polar patterns are essentially equal to the pressure shading on the surface of the array, no close-in interference or chaotic pressure patterns near the array. · Simple implementation requiring only frequency-independent shading and no complex DSP processing for the circular arc and spherical-cap arrays. Here are the three original most-significant Naval Research Lab Acoustical Society papers from the late 70’s and early 80’s that describe the CBT concepts as applied to underwater transducers. Lots of heavy-duty math!! Here are PDF copies of my five CBT AES papers. The same ones offered on my website. Here are the original five PPT files from my CBT paper presentations given at AES conventions. Here are the four PPT posters I prepared to describe the CBT arrays and the prototypes I constructed. These files were converted to PDF files and are intended to be printed out in 3’ x 4’ format. They can be viewed on a computer with some scrolling. Poster 3, which is particularly interesting, compares frontal response curves at different heights and distances of my second CBT45 prototype, measured over the ground plane, compared with a conventional four-way high-end speaker. This clearly illustrates the extreme uniformity of the sound-field generated by a ground-plane CBT array. PDF files of the two CBT patents assigned to Harman. The first (2004) is still pending, while the second, describing the ground-plane version of the CBT array, was issued on Mar. 23, 2010. These files compare the simulated frontal vertical sound field of six different types of line arrays. Very revealing! The sound fields of the two CBT line arrays (Nums. 4, 5) are superior to all the other arrays! Update v2.0: I added six QuickTime movies of the sound field of a single point source, a simulation of a three-way system composed of three point sources representing a woofer, midrange, and tweeter, and a 1.25m (50”) 45° circular-arc ground-plane CBT line array. All are simulated over a reflective and a non-reflective ground plane. The sources of the three-way system are positioned at +0.5m. +1.0m, and 1.15m over the ground-plane respectively for the woofer, midrange, and tweeter. The sources are crossed over at 200 Hz and 2 kHz with 12 dB/Oct Linquitz/Riley crossovers. Page images from Floyd’s book that mention and advocate the CBT arrays. Also included is an image of the book’s front cover. An excellent book! Highly recommended! The figures and graphs are great! d. A ZIP file containing the octave composite bursts themselves repeated at two bursts per second, one burst per second, and one burst every two seconds. A great test for a quick assessment of a subwoofer! Just apply the special burst, and turn it up until distortion is noticed. Photos of a recently constructed CBT ground-plane prototype that was constructed to demonstrate the unique acoustical properties of a CBT array. The array is a 60”-high (5ft) 36° circular-arc ground-plane array suitable for domestic and pro use. The system utilizes 18 each 3.5” woofer-midranges (the equivalent size of single 15” woofer!) and 72 each 0.75” tweeters and is crossed over electronically at 1 kHz with 24 dB/Oct Linquitz/Riley slopes. Note that the ground plane essentially doubles the size of the array. Effectively you are listening to a 10ft-high 72° free-standing CBT array that contains 36 woofers and 144 tweeters! The high driver count means that the system is capable of playing extremely loud, but will stay exceedingly clean and effortless! These are photos of free-standing (non ground-plane) CBT arrays that are installed in a large 1,200-seat North Carolina Church. The church is the Raleigh NC, Cary Church of God (www.carycog.com). The sanctuary system has three very-large CBT arrays installed in a LCR configuration. Three additional half-size arrays are installed as stage monitors behind the proscenium above the stage facing the rear. The sanctuary systems are free-standing 3.5m (11.5ft) tall 78° circular-arc CBT arrays providing a 60° vertical beamwidth. The array contains 56 four inch drivers and 22 ribbon drivers. The system was designed by Marshall Kay in 2007 (http://www.audioartistry.com/) and was constructed and installed by volunteer church members. Marshall started researching line-array systems in 2002, and zeroed in on the CBT arrays after reading my first CBT paper. The design, construction, and installation of the systems were done completely without my guidance or knowledge. Back in 1986, Tim Bock and I wrote an AES paper titled: “The Effects of Interaural Crosstalk on Stereo Reproduction”, and “Minimizing Interaural Crosstalk in Nearfield Monitoring by the Use of a Physical Barrier” (two-part paper included on the CD for easy access and on my website). The paper describes a listening setup where you listen to two small speakers’ located side-by-side in front of you with a board in between. The board acts as a physical barrier to block the Interaural crosstalk. The stereo imaging is amazing and extremely realistic!! All stereo images are virtual and located outside of the speakers and extend over the full frontal angle from ±90°. The center or mono image is the best because it’s actually coming from directly in front of you! Imaging is much better than headphone listening but without any in head localization problems! Depending on program material, the imaging is so realistic that you would swear the sound source is in the room with you! Note that my barrier is reflective, not absorptive. As a result the tweeters must be kept close to the barrier board. As contrasted with electronic schemes that cancel Interaural crosstalk, you do not have to lock your head in position to hear the wonderful stereo effects of canceled crosstalk. You are free to move your head side to side by one head width, rotate your head back and forth by about 80°, and are free to listen away from the rear of the board by several feet (formula in paper, see man standing behind me listening to the system in one of the photos). In addition, the crosstalk minimization gets better as frequency rises. Electronic cancellation only works up to a limited high-frequency limit. One big advantage when you rotate your head is that the images remain strongly out of head and in the intended directions, i.e. when you rotate your head 45° to the left, the images actually arrive at your head from 45° to the right, just like real life! This is unlike headphones where the images always rotate with your head. Side note: I was at Marshall Kay’s wood workshop and office in Raleigh back in April 2010 and noticed two small RadioShack Minimus 7 two-way systems he had on a shelf. This reminded me of their use in my past barrier listening setups. I mentioned this to him and he said he would like to hear the barrier setup. He promptly cut up a 4’x8’ sheet of particle board to 4’x6’, made a opening for the listeners knees, and constructed a platform for the little speakers. The speakers are placed on their side with the tweeter closest to the board. A subwoofer has to be located to the rear of the barrier. (My photos show a box behind the barrier which is actually a subwoofer with electronics.) He was amazed with the imaging! One additional advantage of the barrier setup is that the ground-plane effect of the barrier actually raises the sensitivity of the speakers by 6 dB. This in combination with the close listening distance of about 3.5 to 5 feet, means that the small systems will play very loud! When I listened to a binaural recording of outdoor fireworks, the systems could be played at realistic levels! Try it, you’ll be amazed also! The document you are now reading. A large (104MB, 2 hrs, 15 min) Quick Time video file of my Boston lecture. The flyer announcing my Boston Jan. 14, 2010 presentation. The Power Point presentation for my Boston lecture. A video of the actual presentation is listed below. This is an interesting document describing and advocating an application of ground-plane CBT arrays for sound-reinforcement. Basically, rather than hanging speakers above and forward of the performers for sound reinforcement, this write-up advocates the use of ground-plane CBT arrays located on stage behind the performers. Effectively, the performers and the audience hear the same thing, while the special characteristics of the CBT array partially compensates for near-far volume variation. This pdf file contains nine photos from the Jan. 14, 2010 Boston presentation with Alvin Foster, (Alvin Foster is the founder and past president of the Boston Audio Society). Hope this information is useful. Have fun! D. B. (Don) Keele, Jr.